The Coe Kerr Gallery was once located at 643 Park Avenue in NYC. It was a very prestigious gallery, where Mr. Jones showed his work. Founded in 1968 by Elmore Coe Kerr in partnership with the collector Fred Woolworth. 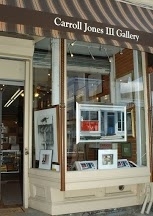 Carroll Jones III Gallery, operated until recently in Jersey City, New Jersey. Carroll Jones III is among the third generation of artists in the Jones family. His father was an illustrator for Life Magazine, his grandfather was a graphic artist who created and manufactured labels in the factory he owned. His mother's side were tin smiths going back 5 generations to Colonial America, and she also was an artist. Working with his hands came naturally. The following people enjoyed his talent, and made it a part of their personal collections. Living across the Hudson from NYC, he is near the heart of the American Art scene.